Why do so many people play online slots? Ever since the first Liberty Bell slots machine was placed in a San Francisco saloon to see if customers would enjoy playing on it, slots have been one of the most popular gambling options around. Now that you can play online, the slots games are more varied and more popular than ever. So why is it that people choose to play slots when there are so many other games to choose from at an online casino? For a start, it’s the accessibility of slots that really draws players in. As soon as you’ve signed up to a casino account, you can begin playing slots. There are no complicated rules to learn – all you need to do is decide which game to play, then how much you want to bet per spin. Unlike more complicated games like blackjack or poker, there’s no need to think about strategy; even if you did, it wouldn’t help you as the results of each spin of the reels in an online slots game is completely random. That’s one of the reasons that players love slots. They’re entertaining every time you play, and you just might hit the jackpot when you do. The prizes are another major draw, and with many of the most popular progressive jackpot games being hosted by numerous casinos, the value of the progressive jackpots climb to amazing life-changing amounts really quickly. 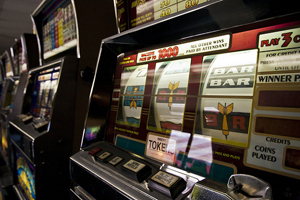 Any player could win, as long as they meet the progressive jackpot gaming conditions – usually betting max for each spin. Slots are one of the most accessible games for people who want to play when they’re on the move as these are the casino games that are most available in mobile format, and are also easiest to play on a mobile phone’s or tablet’s screen. Slots are great for filling time on a commuter journey, as you lose yourself in the fun of the game but at the same time, you don’t need hush around you while you play – like you might do for a game like poker, for example. The reason that many people get into slots in the first place is because when you sign up to many casinos and get a welcome bonus, the bonus credit can often only be used on slots games. At a casino like 32red, the welcome bonus can be used on all the games on the site, but people often still out with slots as they’re so easy to play. And as you can play for such low stakes, it’s not surprising that slots remain the online casino game of choice for so many players.